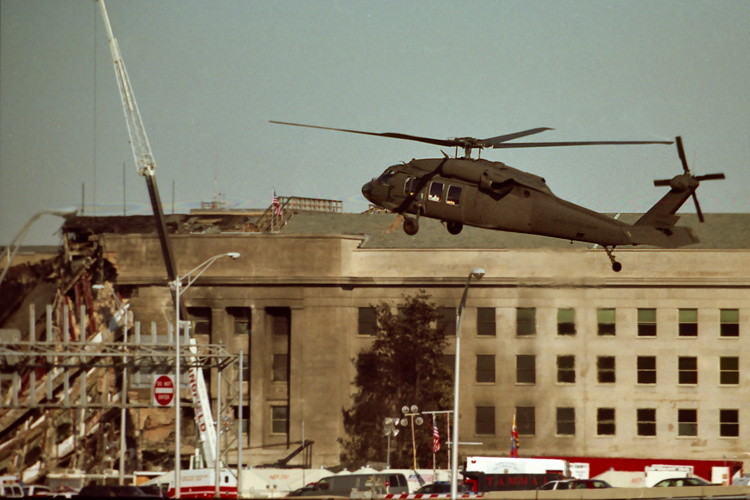 An Army Blackhawk helicopter flies towards the damaged section of the Pentagon prior to the arrival of President Bush. President Bush is coming to the Pentagon today to personally inspect the damage and recovery efforts. September 12, 2001 - An Army Blackhawk helicopter flies towards the damaged section of the Pentagon prior to the arrival of President Bush. President Bush is coming to the Pentagon today to personally inspect the damage and recovery efforts.